Any final thoughts on what I can do about noise from my guitar pickups? This is part 3 of our 3-part series on guitar pickup noise. This section describes a few gear modifications that you can consider, and also talks about a few electronic devices that some players have had success with. I love the sound of my single coil pickups, but the noise really bothers me – is there anything else I can do? After all is said and done, a Fender style guitar can have close to 5 feet of non-shielded, cloth covered wire. There are also a few direct modifications to your gear that are possibilities to consider. One thing you can try is to replace all of the unshielded wire inside the guitar with shielded cable. Any length of unshielded wire much longer than an inch can sense the 120 cycle frequency. Fender guitars are typically loaded with about 5 feet of single conductor non-shielded lead wire. However, you have to think about this strategy before you do it. This is because replacing the lead wire with shielded cable can lead to a slight amount of high frequency loss. 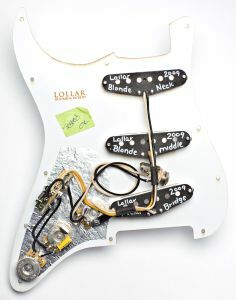 Your guitar may sound slightly darker after making this swap, which is the drawback of this modification. Another thing to consider is a shielding paint. Some builders we work with paint all of the control & pickup cavities with a conductive shielding paint. It is easy to get hold of at Stewart MacDonald’s guitar supply. You paint all of the cavities and also the back of the pickguard. After this is done, and dried of course, you have to attach a ground wire to it. With this approach you can also loose a little high end. The other draw back of shielding the cavities is that it’s easy to short out your signal if a lug on a pot or switch touches the shielding paint. I have heard that there are some other devices out there that can help with reducing noise, is that true? There are in fact some electronic ways of dealing with guitar pickup hum. For example, a noise gate is a device that will sense the difference between when you are playing and when you’re not playing. It will cut off the signal from your guitar when you’re not playing. You set the minimal volume level, and then it automatically cuts off the signal to the amp when the volume goes below this (when you’re not playing). Unfortunately, this can sometimes sound unnatural, and it can also limit your dynamic range. There is also a device called a hum de-bugger. The manufacturer indicates that it is not a noise gate – they call it a hum extractor. I haven’t used one myself, so I can’t comment on its effectiveness. What I can say is that when you are working with certain gear combinations, or if you are headed for a venue that you’re unfamiliar with, then having several noise suppression devices to work with can only be a good thing. What do professional musicians have to say about single coil noise? I have talked to many professional players who tour and record with single coil pickups. Many of them claim that hum is not an issue. Obviously they have learned to deal with it by paying attention to their surroundings and finding a good place and direction to stand. Most often there is a “sweet spot” where noise is dramatically reduced just by pointing your guitar in a different direction. For even more detail on this, please see parts #1 and #2 of this 3-part series.